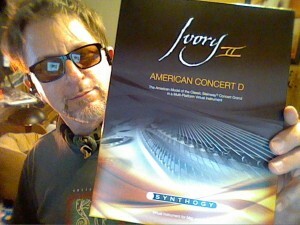 Ivory II American Concert D does not play well with OSx 10.9 Mavericks. Both my salesman at Sweetwater (hey Dan!) and I checked on the internet to find out if Ivory II was compatible with Mac Osx 10.9 (Mavericks). We both found forum posts and blogs that said people were using Ivory II with Osx Mavericks with no problem. Since I found otherwise, I wanted to post this to help anyone else finding themselves in my position. Made the non-refundable purchase and found that indeed it does install and playback in Studio One 2 Professional. But it will not transform into audio or render out in a mix. It also seems to have a lot of problem efficiently using memory. There are many crashes and when I added two separate Ivory instruments the machine gave a lack of memory pop-up before crashing. There is no word on the Synthology/Ivory site to say when a possible update to handle Mavericks might come. In fact, it doesn't even yet say it is compatible with Osx 10.8 Mountain Lion. To make things scarier, there is a whole list of custom install instruction if you are trying to use it with 10.7 Lion. I have my old 32 bit PC system running Sonar 8.5 that I have been trying to leave behind. But due to Ivory II and Drumcore (coming in 64 bit but not here yet), I am still tied to using it for those instruments. Slows things down a lot switching, moving transferring between systems, etc. Using (or should I say trying to use) an early 2012 Macbook pro with 16 gigs of RAM, quad core, bla, bla, etc.